Indianapolis is the capital of Indiana and the largest city in the state. The city is most known for holding one of the largest sporting events in the world, the Indianapolis (Indy) 500. Locals and visitors also look forward to attending Colt’s games at Lucas Oil Stadium. There is much more to this Midwestern city than its sports scene. Indianapolis has also been named one of the best cities to find employment. This could be due to the low cost of living, making it easier to stretch a buck, unlike other cities of similar size. Let’s not forget to mention the city’s friendly atmosphere, beautiful state parks, and delicious food that all contribute in making it a great place to settle down. If you are considering moving to or visiting Indianapolis, there is likely a lot on your plate. Between moving belongings and making travel arrangements, the process can be overwhelming. However, with the help of National Dispatch, it does not have to be. We offer nationwide car shipping services to help relieve some of your moving day stress. Learn more about Indiana Car Shipping. Getting your car to a new city does not have to be a challenge. National Dispatch is a licensed, insured, and bonded auto transporter who specializes in the shipment of cars, trucks, vans, and even motorcycles. Our top priority is to transport your vehicle in a safe and timely manner, while providing unmatched customer service. Here is what you can expect by hiring us for all your car transport needs. We offer both open and enclosed carrier shipping options. You may want to base your decision partly upon the type of vehicle you own in addition to other factors. Open auto transport is the standard method of shipping. It is acceptable for most vehicles. However, due to the trailer’s design, it does not protect the vehicle from the weather and road elements. For this reason, enclosed auto transport is recommended for classic, sport, and exotic models. Enclosed carrier shipping is more costly than the alternative. Anyone may need auto transport services at some point in time. From college students going back to school to those moving because of a career change, auto transport is the easiest and fastest way to get your vehicle to your destination. You can count on us for updates along the way, so you never have to worry where your car is or when it will arrive. Door to door auto shipping is becoming the standard in the auto transport industry. This service is convenient, because it means that the driver will come directly to your home for pickup and delivery. There are some instances when this service is not available, such as when it would be unsafe for your vehicle or the surroundings. In this situation, the driver would ask for you to meet at a nearby parking lot or other large open area. Safety is always the top priority. At National Dispatch, we hold ourselves to high standards when shipping your vehicle. We treat your car as if it were our own. In the case of an unforeseen circumstance, you can rest easy knowing that your car is fully insured during transport. 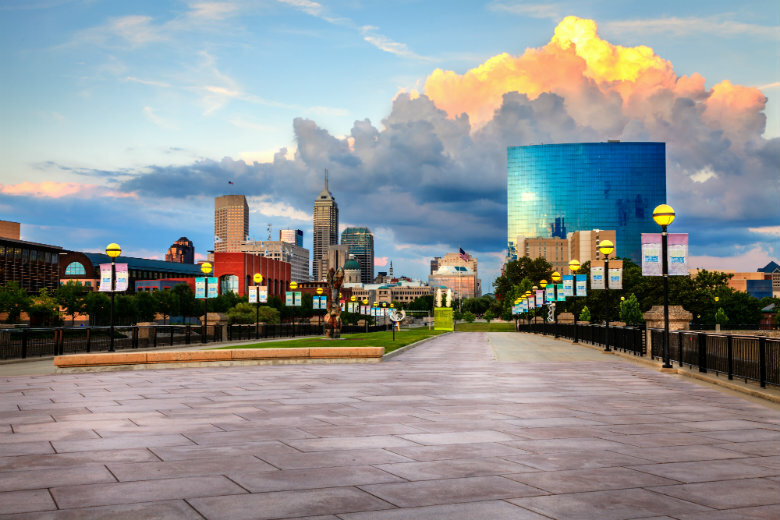 You may have never considered moving to Indianapolis, but after taking a closer look, you may come to see that the city is more than meets the eye. It’s truly a charming place to live. Just see for yourself. When you are comparing Indianapolis to many of its neighbors, you will come to find that it is an inexpensive place to live. Healthcare, groceries, utilities, and even housing is cheaper in this city. With many affordable housing options to choose from, it’s no wonder Indianapolis is home to nearly one million people. The city is a great place to start a business or look for new employment opportunities. Technology is popular. However, there are other industries prominent in Indianapolis, as well. This would include finance, manufacturing, insurance, and more. Indianapolis is in the perfect location for short weekend trips outside of the city. You can reach Chicago, Michigan, Cincinnati, Louisville, and Detroit all within 3 hours by car. As if Indianapolis does not offer enough amenities and attractions, your list of options just got longer. The residents are known for their neighborliness. The friendly atmosphere, along with the numerous attractions, makes Indianapolis the perfect family destination. There are inexpensive museums around the city, with the Indianapolis Children’s Museum being one of the largest in the nation. In addition, when it comes to education, there are many options to ensure that your child gets the best schooling, available. There are over 100 parks in the city with opportunities to walk, bike, hike, and more. It is also said that the roads are primarily flat, which makes it easier for cyclist. The most popular trails are the Monon, Pogue’s Run, and Cultural Trail. The Skywalk offers a unique weather-free walking experience. It provides you with a convenient way to walk through popular parts of the city, even when the weather is frigid. There are thousands of car shipping companies to choose from by conducting a simple online search. However, just because the internet has made it easier to find companies and there are endless options, it does not mean your choice has become easier. The challenge is finding an auto transport company that is reliable and trustworthy. At National Dispatch, our top priority is providing safe, easy, and convenient auto shipping services. From large corporations and dealerships to the everyday consumer, we can handle it all. If you are looking to ship a car anywhere in the nation, request a free, instant car shipping quote using our online quote calculator. No personal information is needed. You can also call us at 800-321-2051.